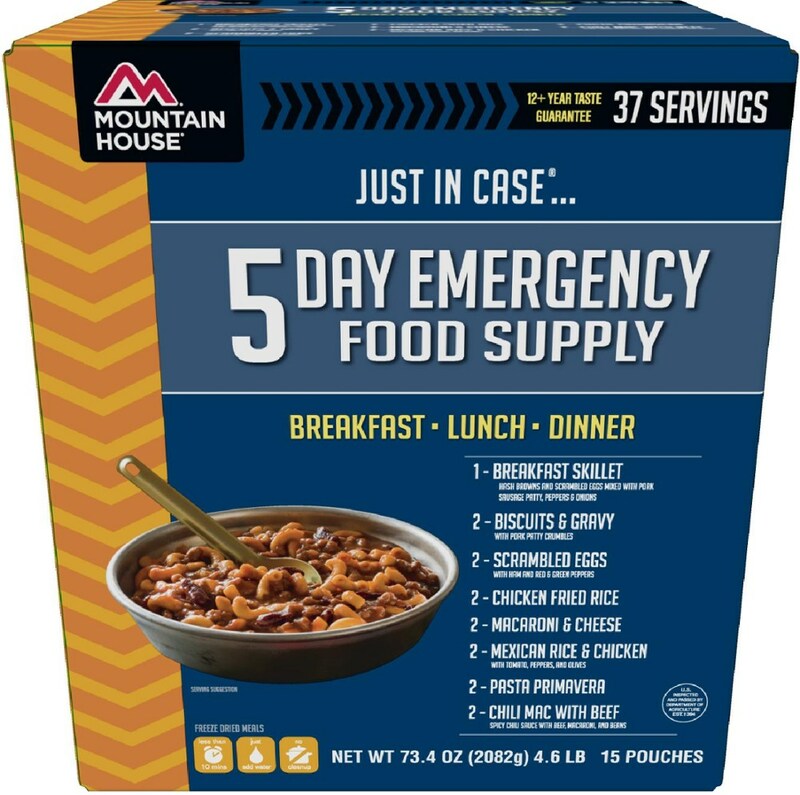 This is a staple in my pack now for over a year—hydrates well, tastes almost as good as home cooked chili, and fills the corners without leaving me overstuffed. I haven't found a better dinner entree, except packing in fresh food. 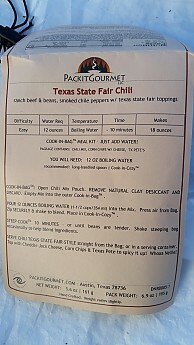 I finally decided to review what I consider to be one of the best prepackaged dehydrated meals on the market: Packit Gourmet's Texas State Fair Chili (TSFC from here on). 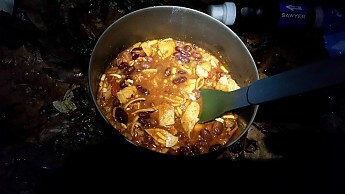 TSFC is easy to prepare, and provides good, satisfying taste and nutrition on the trail. 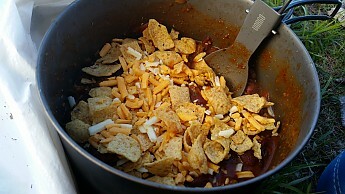 The natural ingredients and extra toppings (cheese, corn chips, and Texas Pete) round out the excellent flavor. 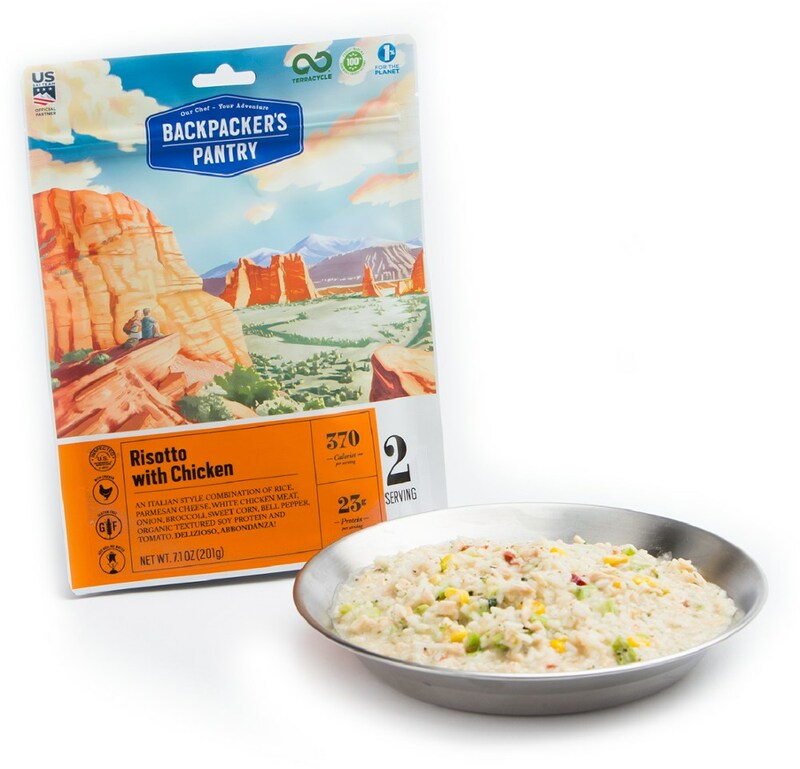 I have not had a better tasting trail meal and feel that the only downsides are the extra packaging and weight, along with high sodium and price, like a lot of meals. I am not sure I can overstate how good TSFC tastes. 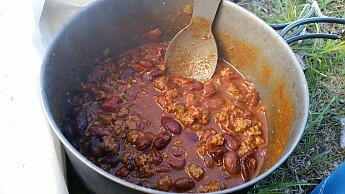 My wife and I cook a pretty good chili at home, and the TSFC meal holds its own! I'll back this up by mentioning that I just reordered a season's worth of it from Packit Gourmet and carry it on almost every trip. 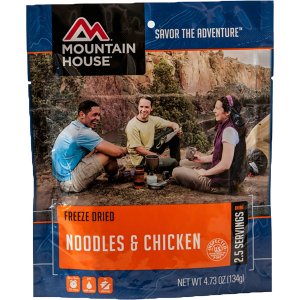 I am not a big fan of freeze dried or other store bought backpacking meals in general, preferring to cook my own home dehydrated meals. 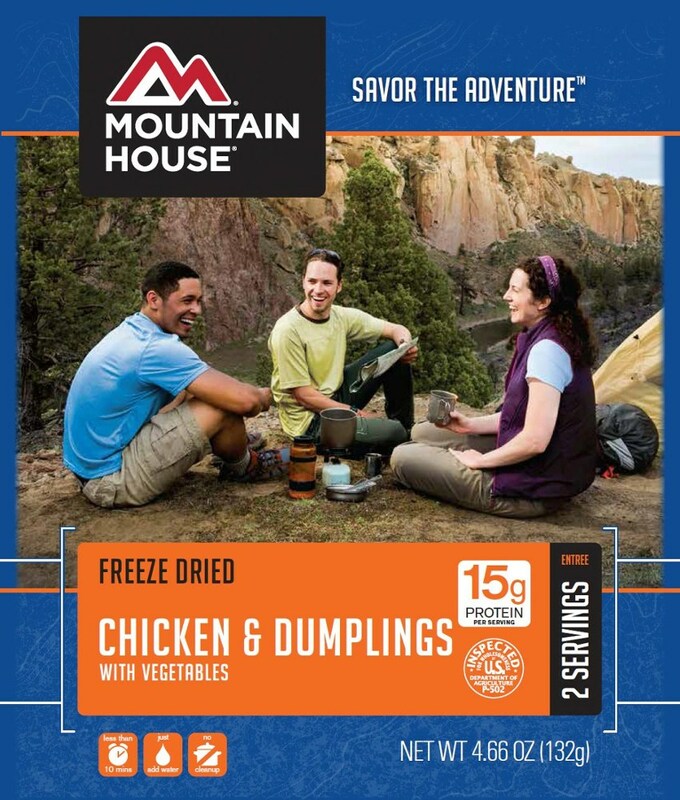 I think this makes me rather picky when it comes to dehydrated or freeze dried meal reviews. 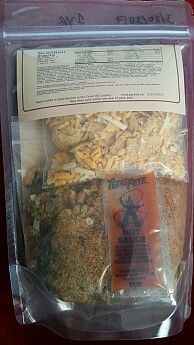 That said, I have carried a TSFC dinner on most of my trips since discovering this great tasting meal. I have prepared and eaten TSFC over eight times in 2016/2017 and in conditions ranging from 10-degree winter nights to 80-degree spring/summer evenings. Preparation has followed the instructions on at least three occasions, and simmered in a pot the other times. Preparation is simple...take the chili mix inner bag and dump it in the main bag (don't forget to remove the natural clay desiccant!). Boil water and add it to the main pouch, mix it well, and let it sit for 10 minutes. I tend to add a little more than the recommended 12 ounces of water, but that will be trial and error and vary based on your preferred consistency. I use extra as I add all the toppings that comes with it. Re-hydration takes the stated 10 minutes. I sometimes overdo that based on temperature etc, but the beans re-hydrate very well within the time under normal conditions. Make sure that you have a hydration "cozy" of some sort or an insulated jacket etc to wrap the bag in and retain the heat. I use my Reflectix pot cozy and it seems to work fine. After adding the toppings of cheddar-jack cheese, corn chips, and Texas Pete hot sauce you have an excellent meal. 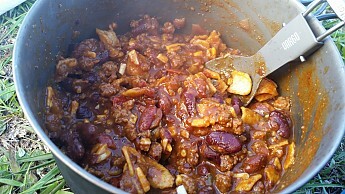 You can taste the beans, ground beef, tomatoes, peppers, and spices as if they were fresh. This meal fills me up just perfectly after a long day on the trail. I usually skip dessert or other snacks after eating this unless I am absolutely starving. For my metabolism, TSFC hits the perfect spot—filling the corners but not overfilling and leaving me feeling bloated. 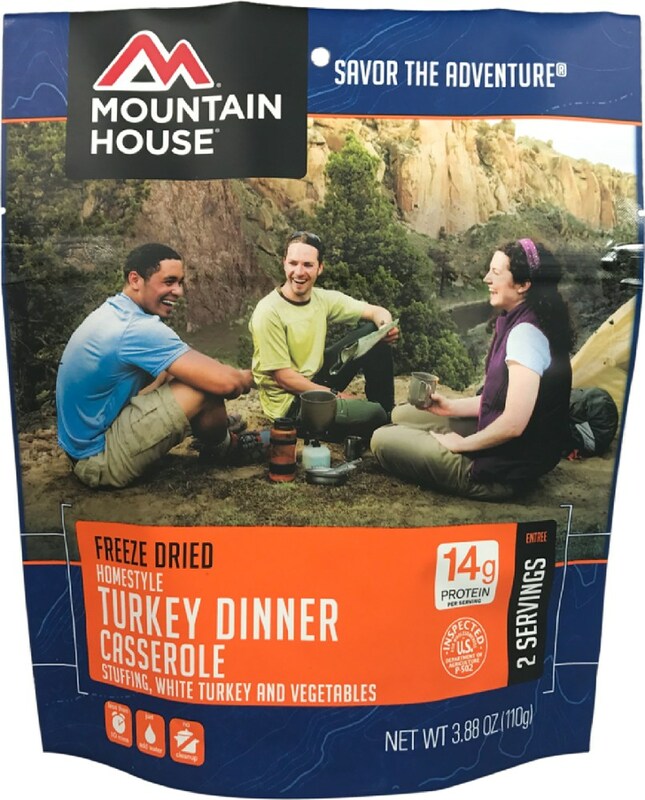 When backpacking with my better half, we have split this as a dinner and supplemented it with an appetizer/snack plus dessert...almost feels like you are dining in a restaurant except with much better views! If I had to find one flaw in the taste it would be the amount of heat for those who prefer really hot chili. The Texas Pete gives it a kick but this is a personal taste issue and if you like fire-hot chili plan to bring your own supplement (I always carry Cayenne pepper powder in my supplemental food bag). The ingredient list shows it is made (as usual from Packit Gourmet) with natural and fresh ingredients including ground beef, red and kidney beans, Monterey Jack and cheddar cheese, tomatoes, peppers, onions, and many more tasty treats. I could pronounce and understand everything on the ingredient list, although I did have to put on my reading glasses to see the small font! TSFC provides all the nutrition I need to replenish including 650 calories, 71 grams of carbs, 18 grams of fiber, 39 grams of protein, and 25 grams of fat (zero trans fat). 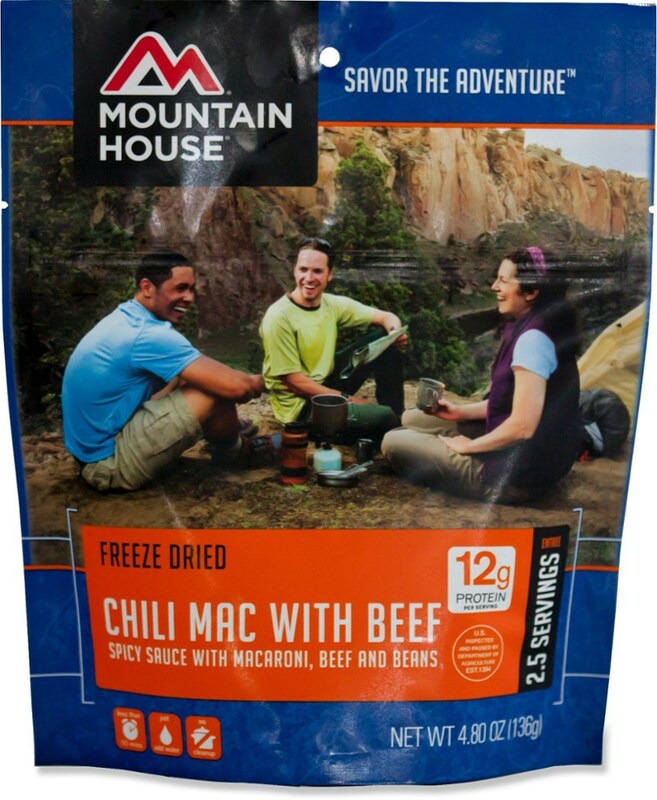 The only downside for me is the high sodium content (1520 mg or 63% daily value), but that is the case with most trail meals and chili. 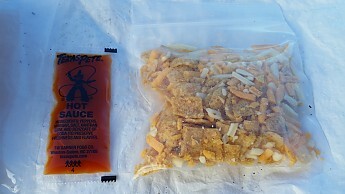 TSFC is well packaged with the standard Packit Gourmet tough outer bag for cooking/re-hydrating, and two similar well-constructed smaller bags inside (the main chili pouch and the toppings). In addition, there is a"fast-food" single pack of Texas Pete. The downside to the sturdy packaging is a little extra weight (just under 7 ounces) than some meals and extra trash to take home. I avoid the packaging issue by redoing it at home—for some weird reason I don't enjoy meals out of a pouch as much as ones in my favorite Vargo pot. So I just simmer cook it in that for up to 10 minutes but usually less (no fuel issues as I usually use the wood burning option on my Caldera Cone Sidewinder). I did test this meal several times following the instructions, and it doesn't taste any different (in fact it was so good each time I forgot to take a photo of it in the bag before dumping it in the pot!). It's the act of eating it out of the pot I like, so dump some of the packaging at home to simplify things. I also like to vary the amount of water a bit if I feel like a little more soupy consistency versus more solid. I can't recommend this meal more highly. If you haven't tried it or some of the other excellent Packit Gourmet offerings, you should definitely give it a go! Great review, Phil! Thanks so much for sharing it. Thanks Alicia. Just threw two more in the pack for next week's excursions in Maine and New Hampshire. Trying to be diverse in the diet but this stuff is too good so I am limiting to one per state! Nice review! I'd get this, but as a Texan what surprises me is the inclusion of beans. There are no beans in chili. That and the New York made Texas Pete. I've written PG in Austin about these egregious inclusions and received a nice, but dismissive reply. ;) :) Seriously, It's good chili if you like beans i yours. I personally do not. Have you tried their Marketplace Pasta Puttenesca, or Dottie's Chicken and Dumplings? Those are my absolute go-to meals from PG. Cheers! 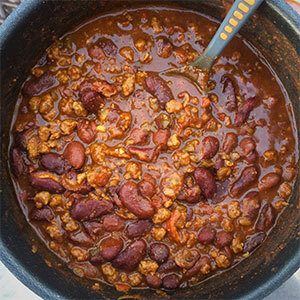 We do like beans in chili, and didn't think about putting that as a negative! By the way, Texas Pete is not NY based...much more authentic than that...it was created here in NC where a BBQ restaurant owner wanted to make his sauce sound spicy. I haven't tried the pasta one but do like the chicken and dumplings. Thanks. 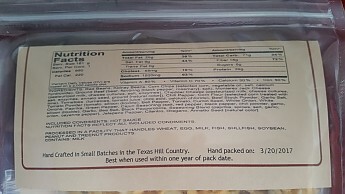 The Packit Gourmet Texas State Fair Chili is not available from the stores we monitor.